Greetings from Switzerland! I write this while looking outside a window at a mountain in the Swiss Alps. 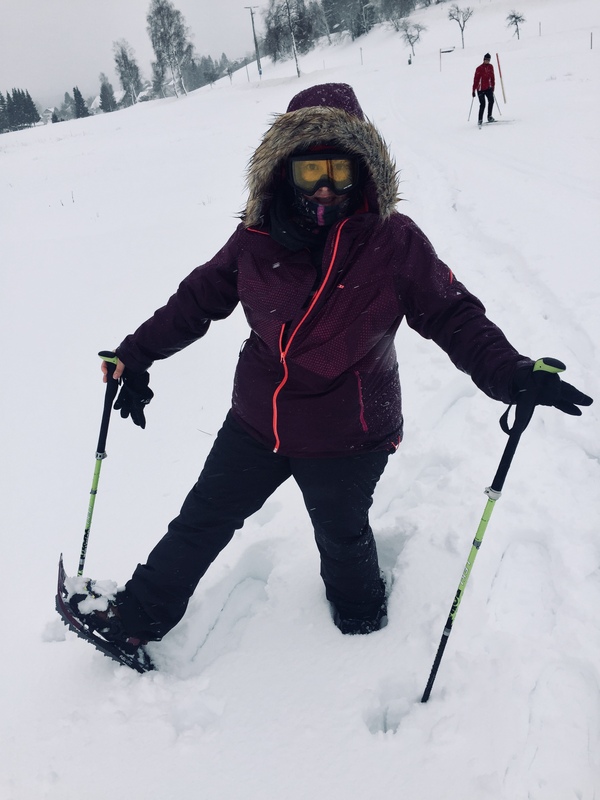 It is an incredible winter wonderland, and makes me want to sing, “It’s a marshmallow world in the winter!” My husband, baby cousin and her husband are somewhere on the mountain, enjoying beautiful powdery snow and getting in some ski runs. Meanwhile, I am sat in a restaurant with skiers coming in and out, having lunch, laughing and enjoying their holiday. The guy at the table next to me has just dumped fresh snow on the floor as he untucked his shirt. Yesterday’s fun at a mountain in Germany caused me to feel a little too much pain in my right knee, so I’m sitting today out. When your job requires you to walk around London all the time, you think twice about falling on skis and taking a tumble. It’s kind of sad, but I’m going to use the time wisely. Namely, to work. Don’t feel too bad for me, you have to remember that I am obsessed with my work! I love my job, so it doesn’t feel like work. Actually, if I had to compare it to turning right on a mountain, in this moment…. this is alot less work than that!!! One of the things that I don’t find enough time for is writing my blog. It’s one avenue of many where I can communicate, but after all the talking on a daily basis, the emails and the social media, I just run out of steam and the blog sits empty. I have attempted many times to write in my phone some of the blog ideas I have, but they never make it to the website. Like many of you, I have made some resolutions for the new year, and blogging more is one of them. It has been on the list for the last three years, so don’t hold your breath! But I will try! January is a month that is busier than people think. I have always had these visions of me sitting in a library researching some amazing new walks, sipping lots of tea as I plan out new routes and toiling over my sewing machine as I make new costumes. Unfortunately, that never happens because I am always doing tours! Since other parts of the world have summer holidays in January, they end up in London and looking for a fun tour. I also do some Paris multi-day coach trips with large groups, which are great fun because it is something different to my regular tour schedule. While I am on a long weekend skiing, next weekend I’ll be stuffing a macaroon in my mouth in between chatting about Versailles and the Louvre! One thing I am doing, when the tour schedule allows, is to go through some of my old publications and get them on here! 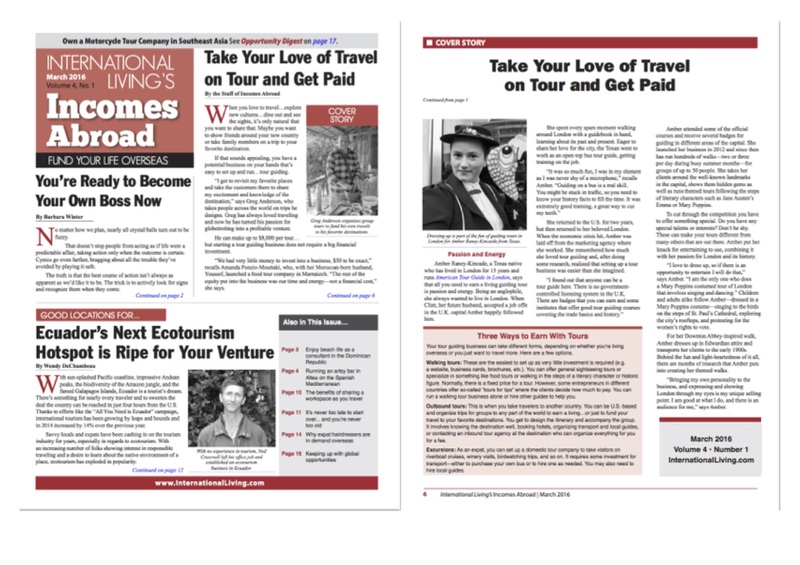 Yes, in addition to tour guiding, I also write articles for various publications or I have had articles written about me. Like the one in the photo above — I was interviewed about making a living doing what I love. It’s ironic, because one of the main contributors to the newsletter was Barbara Winter, who wrote the book “Making a Living Without a Job”. I read that book 4 times! So when I found the article the other day in a pile of emails, I couldn’t believe that she was in the newsletter, too! I kind of feel like I have met her now! Lol! I thought I would share that article here because I am often asked about how I do my job. This is a pretty concise explanation of why and how I started as a tour guide. Perhaps I’ll build up some more exciting things to write about and share them with you on this blog. I hope so, because in finding this time to sit and get some words onto the screen, I’m actually finding it a little fun!